I have always loved colorful hair, but I was always too scared to try it. 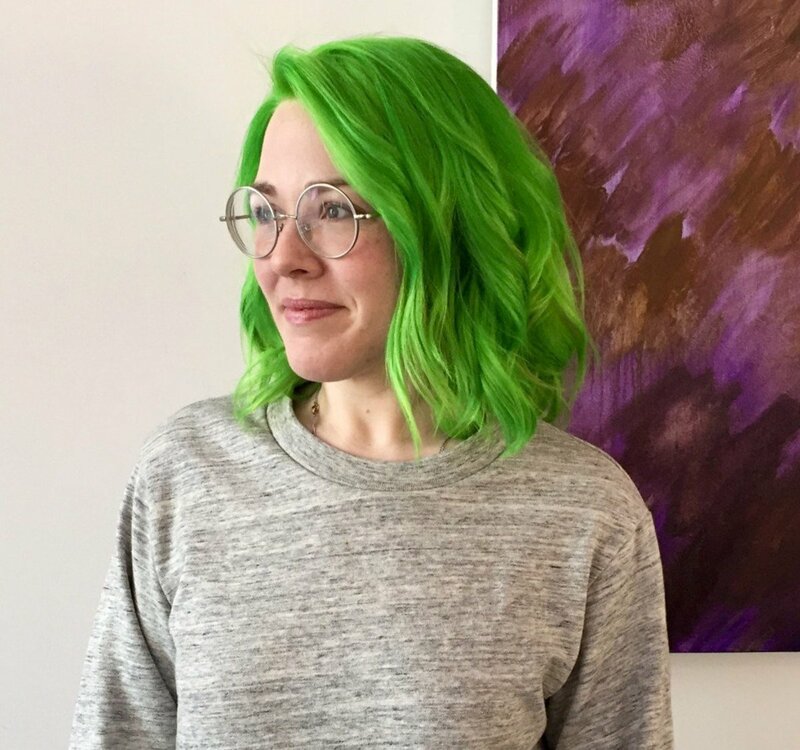 I'd had a few hair dye mishaps through high school and college, and I was worried that doing a bright color would exacerbate my lack of ability when it came to choosing the right colors and methods of applying it. After my last dye job to go back to blonde when I was a junior in college, I vowed I was going to let my hair grow out completely natural, and not dye it again because I wanted my natural color again. For three years, I did absolutely nothing to my hair - no dye, no lighteners, nothing. I barely even used hair spray. But a year out of college, I had an itch to do something different. Initially I thought I might cut it, but then almost six months went by since i initially had said that -- and I still hadn't cut my hair. So I knew that I wanted to do something different, but non-committal at the same time. The perfect solution? Dip dying my hair. I knew it was right for me because while I liked the full head of bright color a lot, I was too chicken to do my whole head. 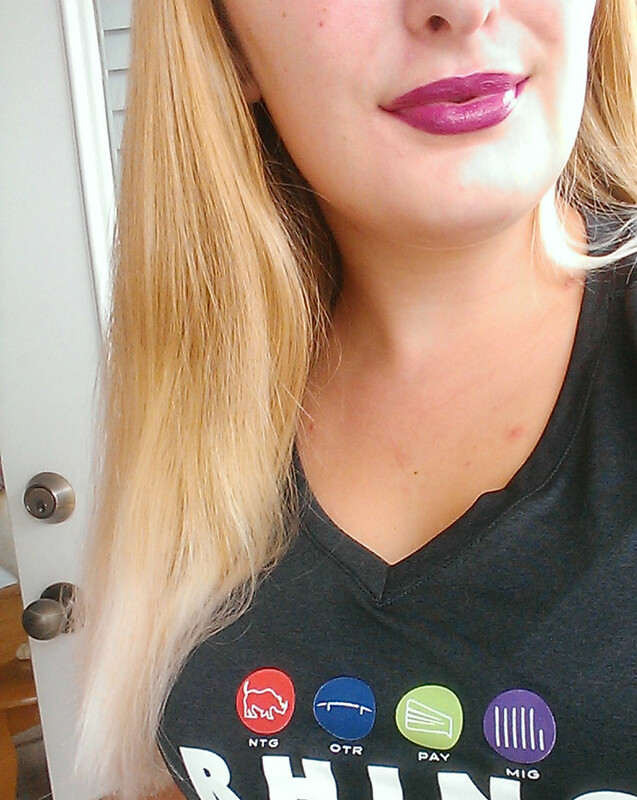 The only way, I decided, to get the bright colors that I wanted was to dip dye it, because then if it didn't turn out or it got too damaged, I could chop it at my chin and start over - and so began my hair color journey! Let me start out by saying: I am not a professional. The results I achieved in my dip dyes were purely by experimentation on my part and what I have found works best for me. If you are antsy about any of the steps I have listed, you should definitely have a professional do your hair instead of attempting it yourself. If you're in the Charlotte, NC area, I highly recommend Shawn Thao at Sola Salon in Rivergate. If you're in the Atlanta, GA area, I recommend Vincent Mancine at the Ulta Salon on Perimeter Center West. Look them both up - they are wonderful! 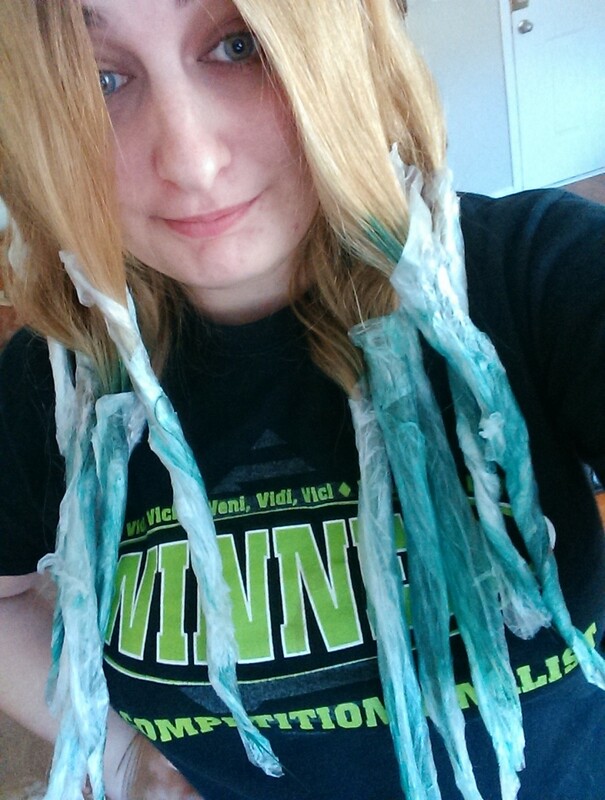 The first step to getting your colorful ombre is bleaching your hair. In order to bleach properly, you need to know a little about how hair bleach works before you do it, or you could seriously damage your hair. Most hair bleach comes with two components that you have to mix together in order to make the mixture that goes on your hair: lightener and developer. The lightener itself is typically a powder, and then you add a liquid "developer" to the powder in measured amounts to create the mixture. The developer comes in different volumes in order of lifting strength: 10, 20, 30, and 40. My preferred brand of lightener and developer is by Ion. It comes in a purple bottle or jar and you can get it at Sally Beauty Supply or Amazon. 10 is the weakest volume and will take the longest to lift your hair to lighter shades. 40 is the most powerful and works the fastest to lift your hair to a lighter shade. BUT using 40 developer comes with a price. Because it pulls color out faster, it will damage your hair much more quickly. My recommendation for anyone with any color of hair is to start with 20 volume. If your hair is really dark you could use 30 volume. Now, I can understand the yearning to have the end result quickly - but trust me on this, you really want to be patient when working with hair lighteners. When lightening your hair you will almost never get the shade you are looking for after the first round unless your hair is already very blonde to start with, OR you don't want it to be platinum before you put the color in. If your hair is dark blonde, like mine is, you may need two rounds of lightening to get your hair light enough. If your hair is dark and you want the hair to be platinum before you apply your color, you are looking at a minimum of 3 rounds. 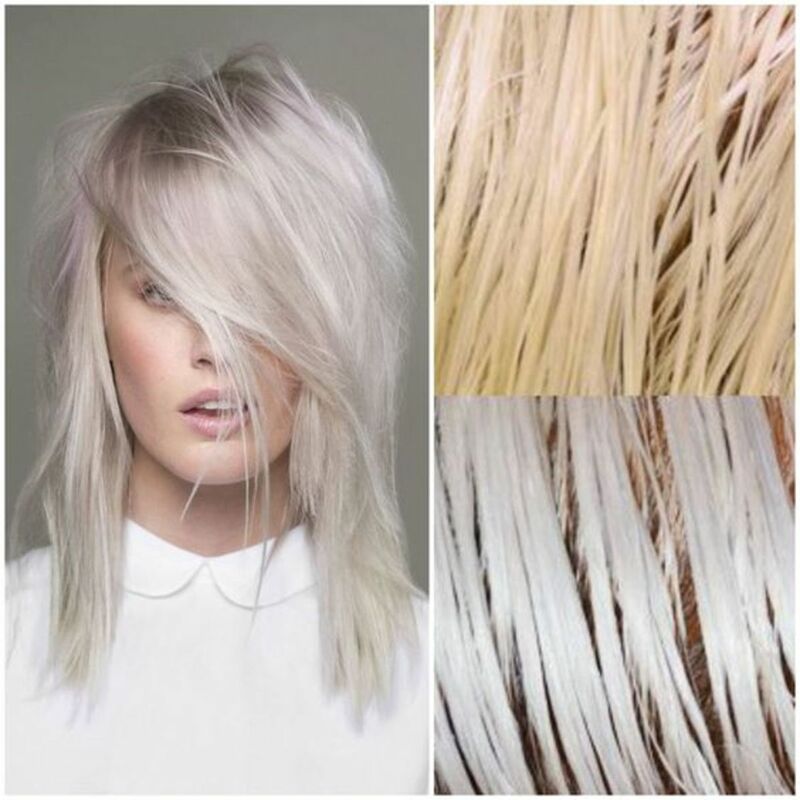 Keep in mind that your hair does NOT need to be platinum or white before you can put the color in. You can stop lightening your hair if you are happy with the result before it gets to platinum. You just need to know that the darkness of your hair after lightening will affect how bright the color appears. The whiter your hair is, the brighter and more vibrant the color will be. The darker your hair is, the darker and more muted the color will be. When bleaching your hair, if you choose to do multiple sessions, it is best to space out the bleach sessions between 3 and 7 days to let your hair rest, making sure to condition it well in between sessions. If you have to bleach more than twice to lift the color out enough then you definitely need to space it out much longer, between 7 to 10 days. 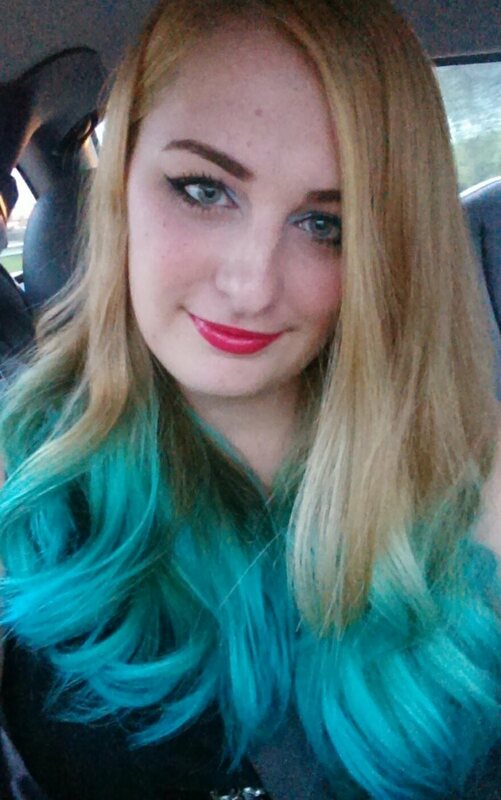 The first time I dip dyed my hair, I had it done professionally. I was a little too scared to do the bleaching just yet, so I had my stylist do a nice navy-turquoise color by Pravanna without bleaching my ends. The color looked SO awesome and it turned out great. But the problem with my hair, which up to that point had not been dyed, was that it didn't absorb the dye very well. It looked so gorgeous but started fading after the second time I washed it, because my hair was so thick and strong that the color did not take very deep. 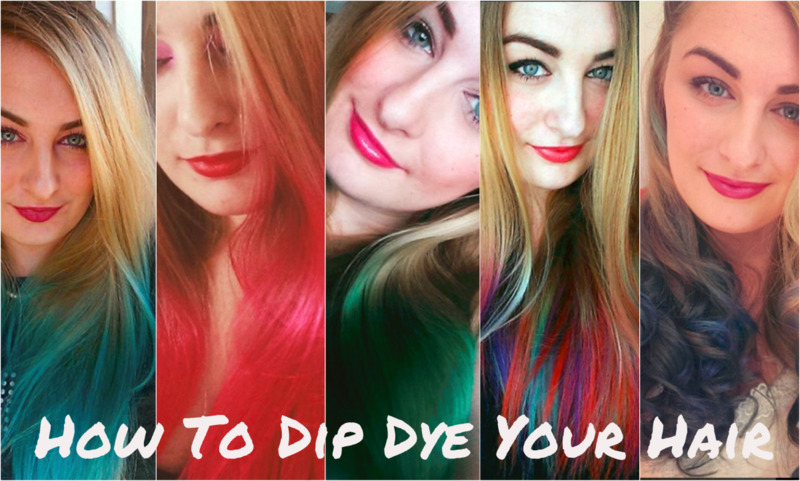 If you are non-committal to bright colored hair, and your hair is not bright blonde already, I do recommend dip dying without the bleach so that you can see whether it's something you want to do in the future. I also recommend getting it done professionally the first time, just so that you can get a feel for everything and know that it will look awesome the first time around before you start trying to do it yourself. However, you can definitely do it at home with a couple of hours and an extra hand! You will need gloves, a bowl for mixing, powder bleach, developer, plastic wrap or tin foil, and a hair color applicating brush. Decide on the line where you want your eventual color to stop so that it can fade into your normal hair color. For me, that line was about 8 inches up from my tips. Divide out a section of hair and mark that line with a clip or a hair tie. If you are confident enough eyeballing it instead of marking it, you can do that. Mix your bleach and developer in the bowl according to the directions on the packaging. If you decide to use the Ion at Home brand, it will turn to a thick, heavy purple foam after a minute or so. Apply the bleach to the section of hair from the tips to about two inches under the section you marked. Make sure that the entire section of hair under your cutoff line is covered. After the bleach is applied, wrap the section with a piece of tin foil or plastic wrap to keep the bleach from getting on anything as it takes to your hair. Move on to the next section and repeat steps 5 and 6 until all of the sections you wish to bleach are coated. 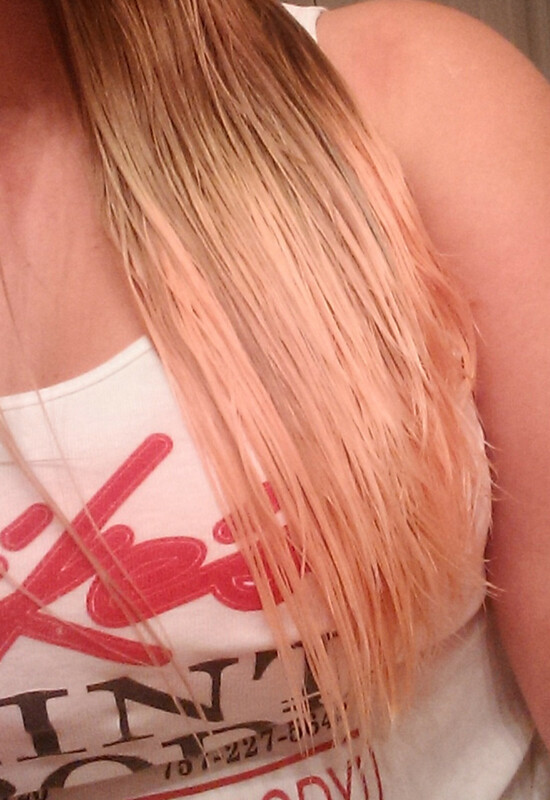 Let the bleach process. I would not leave it on more than 20-30 minutes. You will see the bleach start to lighten your hair relatively quickly. After the processing time has passed, jump in the shower and rinse everything out. Use shampoo and conditioner. Apply either hair oil or leave in conditioner after you get out of the shower to help re-moisturize your hair after the bleach. I like OGX Moroccan Argan Oil or It's a 10 Miracle Leave-In. You may blow dry your hair if you wish, just be careful not to concentrate the heat on one section of your hair for too long to prevent damage. You can also let it air dry if that is your preference. If you feel your hair still needs another round of lightening, wait a few days before rebleaching. 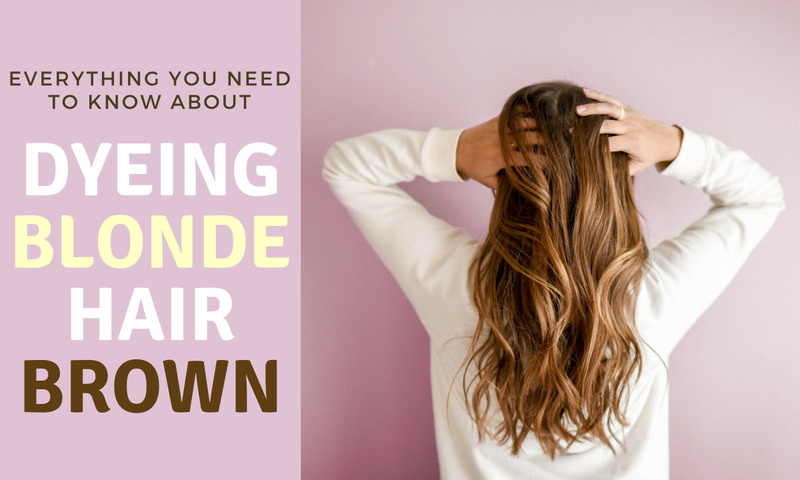 Darker hair will definitely need another round, because the first round will probably only lift your hair to a reddish brown the first time around. Before you apply your color to your bleached ends, you may notice that the bleached areas of your hair look a little brassy or orange. There is an easy fix for this. A night or two before you are ready to put the color in your hair, wash it first with purple shampoo. 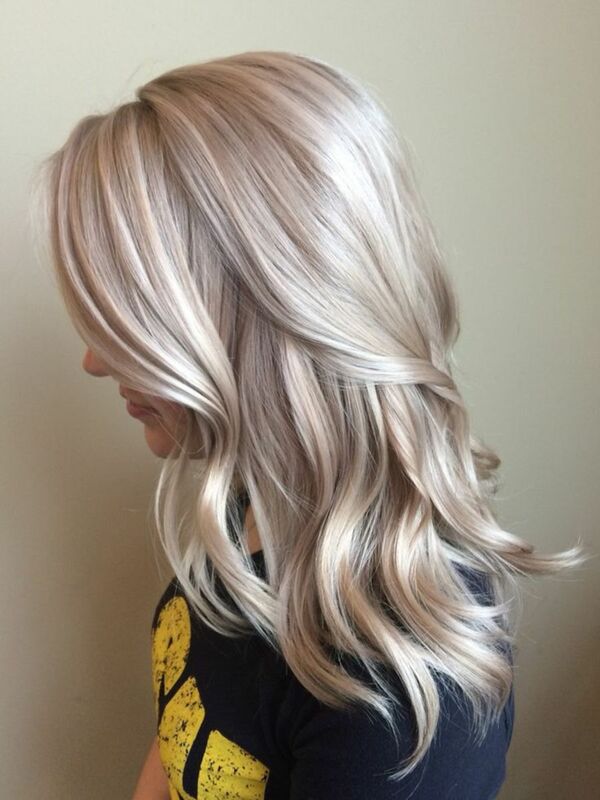 Purple shampoo takes the yellow, orange, and red tones out of your hair to make it a cooler blonde, which is generally preferred prior to applying any bright color to your hair. As far as purple shampoos go, there are so many to choose from but I personally really like Generic Value Products Purple Shampoo. It works just as well as the name brand products and smells really good too! To use purple shampoo, you will apply it in the same way you would apply normal shampoo, except you'll want to let it sit for a minute or two before washing it out. You'll notice an immediate difference after washing it out that your hair is a cooler shade of blonde. Don't leave the purple shampoo in too long or else it may tinge your hair the same color! Apply conditioner after rinsing like you normally would, and once your hair is dry you are all ready to apply your color. This is the fun part: it is now time to apply your color so you can achieve your vibrant ombre look. First, you'll need to choose your color. There are many different brands of color to pick from, so make sure you read the reviews and look at pictures of people who have already used the color you're looking at so that you have an idea of how it will turn out. I personally have used Manic Panic, Ion at Home, and One 'N Only dyes. All three are great semi permanent brands and can be found online or at Sally Beauty Supply. I have found that One 'N Only tends to be more permanent than Manic Panic, mainly due to its addition of Argan Oil into the dye formula. Argan Oil bonds to your hair really well and therfore their colors are quite a bit more steadfast than Manic Panic and Ion Color Brilliance. Manic Panic has the absolute largest color selection of any brand, so you would definitely be able to find the color you are looking for. Ion Color Brilliance has some really great colors and their bright ones that I have used all fade to really gorgeous pastels after a few washes. If you aren't finding the exact color you are looking for, it is ok to mix the dyes to get the color you want. All of the brands are non-toxic and don't contain any chemicals that would damage your hair, but just because of the formulations between each brand I recommend only mixing colors within each of the brands rather than mixing the brands themselves to make a new color. You will need your chosen color, two bowls, gloves, conditioner, plastic wrap or tin foil, and a hair color applicator. Section off a piece of hair to work with first. Apply conditioner about three inches above the bleached portion of the hair, down to one inch above the bleached section of hair. This helps prevent any stray hair dye from getting where it doesn't need to go. it also helps the color fade nicely into your natural color like a smooth gradient instead of a choppy color. Using the hair color applicator, apply color directly to the bleached portion of your hair. Make sure the entire strand is coated. Pull the color up all the way to meet the area you applied conditioner to. Wrap the section of hair with tin foil or plastic wrap, and repeat the process for the next section of hair, until all sections of hair are complete. The nice thing about all three of the dye brands I mentioned above is that you can leave them in for long periods of time and it will not damage your hair. I recommend leaving the color in for 45 minutes to an hour to ensure that your hair takes up as much of the color as possible. After the hour is over, jump in the shower and rinse all the hair dye out until the water is running mostly clear. Apply conditioner. After you get out of the shower, apply your hair oil or leave in conditioner same as you did after the bleach, and either air dry or blow dry according to your preferences. Don't apply shampoo directly to the colored portions of your hair. Apply it only at your roots, and rinse it out without scrubbing it into the colored parts of your hair. My hair was actually long enough to where I could hold the colored part in one hand out of the way while I shampooed and rinsed my roots. Then, I would let my hair down when the shampoo was out and I was ready to apply conditioner. Try to stay away from shampoos that contain sulfates and also clarifying shampoos. Both will strip your color away faster. Don't let your hair in chlorinated water. If you had to bleach your hair multiple times prior to dying, always apply a leave in conditioner or hair oil after getting out of the shower to help keep breakage to a minimum and close up your split ends.